I have mentioned several times that I belong to a dinner club and we meet at assorted restaurants around the Metro Detroit area. One of the requirements that we need is a room that will handle on the average of thirty-five members in a private room. The other needs are a choice of at least three different entrees and a bar. Three members of the club are the hosts for the evening and they have the right to select the venue and the menu. One time the club met in a historic building that became a restaurant in Hazel Park, Michigan called The Farm House. At one time, the building was actually a home on a farm, but it became a full fledged restaurant later in its life, and it was known for its baking and specialty dishes. We always start off with a cocktail hour, which is where I can try some wines and if not, I can always count on a couple of whiskey sours. Then we start with a house salad, which is the norm, and this restaurant had some of the best bread being served on the tables. We had a choice of trout, a strip steak or barbequed spareribs. This restaurant was known for their buttery fish plates, but I opted for the ribs, because when ever I can find ribs that fall off the bone, it is a done deal. I enjoy spareribs, I just do not like picking up a bone and gnawing on it, and I would rather use a knife and fork, and believe me there have been plenty of discussions about it, with people questioning my sanity. 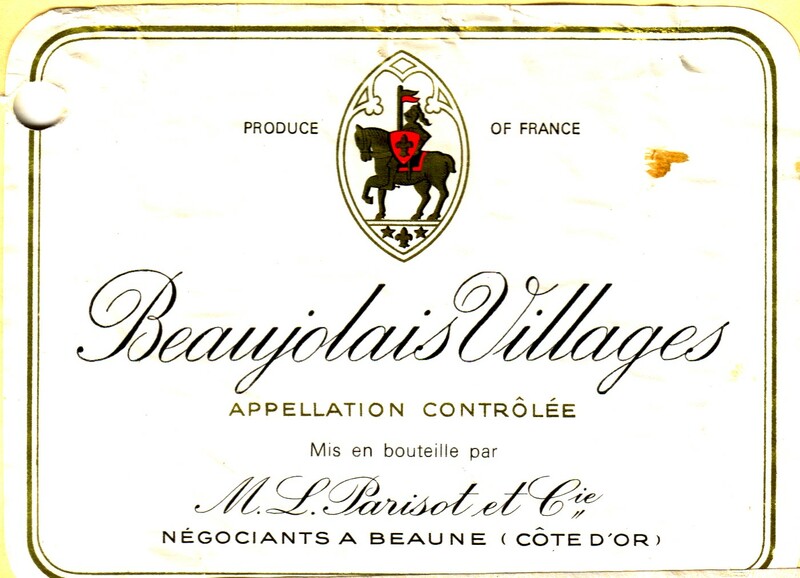 One of the reasons also that I went with the ribs that evening, was that they had a very nice bottle of Beaujolais-Villages wine by the negociant M.L.Parisol et Cie. Beaujolais-Villages are the second tier of wines for Beaujolais. There are thirty-nine villages or communes that comprise this rating, but these entities are unknowns in comparison to the Cru Beaujolais, which is the top ranking. When I can find a Beaujolais-Villages bottle of wine, I like to order it, as I find it to be quite nice and not as dear as some of the Cru wines, and certainly they have more finesse and charm than either a Beaujolais Nouveau of just a Beaujolais designation. The sad thing about this memory is that this restaurant is no longer there, because it has been replaced with yet another chain drug store, as if the world has a shortage of these stores. This entry was posted in Dining, Wine and tagged Beaujolais-Villages, France, Gamay. Bookmark the permalink. I remember this restaurant well. Our company often took visitors for lunch. Their desserts were delicious, as well, especially the pies. Thank you for stopping by and I hope I brought a smile to you, when you remembered the restaurant.